High capacity bottomless elevator bucket system. 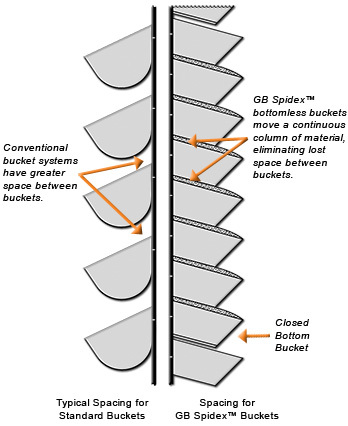 GB Spidex™ buckets are closely spaced with a series of buckets without bottoms followed by one bucket with a bottom. The material is lifted in a continuous column and the carrying space normally wasted between conventional buckets is fully utilized to achieve much greater capacity. The buckets pick up and discharge conventionally, but care must be taken in the design of the boot and the head. ** Bucket spacing for free flowing granular products only. * Fixing holes GB380-165 -- alternative hole punching available: slotted for 101mm to 104mm holes. Note: Spidex 100-90, 130-110 and 180-140 buckets have flat holes with notched back. With the GB system, buckets are centered at very close spacing with a series of buckets without bottoms followed by a closed bottom bucket. The material is lifted in a continuous column, so the carrying space between conventional buckets is fully utilized by material to achieve much greater capacity. The buckets "fan out" as they pass over the head and tail pulleys to facilitate pick up or discharge. The system increases capacity of an existing elevator leg at a much lower cost than the purchase of a new bucket elevator. The GB system can also be used in new elevators to give the same capacity as larger elevators using traditional buckets, saving manufacturing costs and plant space. GB Spidex™ buckets are particularly useful with sticky products which can clog up the bottoms of conventional buckets reducing capacity and increasing maintenance. With GB buckets, only the bucket with the bottom can become clogged, and capacity can be rated to allow for this. The remaining buckets, being bottomless, are self cleaning. 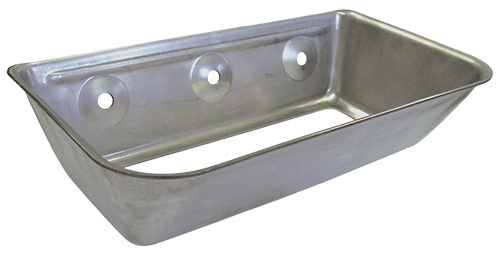 Aeriable products are also handled easily as GB buckets have the ultimate vented design. Whether your leg is handling grain, feed, meals, fertilizer, or industrial materials such as free flowing cement, 4B can design a GB Spidex™ bucket system to deliver the capacity you require.